There I was in the podiatrist’s office being fitted for a new pair of orthotics, the doctor’s latexed hands wrapping my right foot with soggy strips of plaster for the casting, and thinking to myself: “You don’t remember the last fitting, do you?” just as the doctor echoed these same words out loud. It was then that I thought of her, my childhood sweetheart - and how the night before over dinner she said: “I put Windex, Bob, Windex, in the refrigerator last week and didn’t remember doing it! Tell me I’m not showing signs of early dementia! Tell me I’m not!” She was in town for her thirty-one year high school reunion and we were seeing each other for the first time in twenty years. She was a bit undone by all the late night reunioning and by the divorce that was cleaving her life apart. “I don’t want to get old, Bob,” she said mournfully, “but it’s happening and I can’t stop it. I am turning fifty next year and I still rollerblade. I didn’t get the memo in the nineties, Bob, that said: Hang up your blades, the fads over.” The podiatrist was now at work on my left foot, wrapping it like he had the right, when he did something unexpected - or so I thought: just above the arch, on the left, he took a firm grip, leaned in a little, and began to press. Hard! I watched him do this. For a while I watched him do this, as if it were some alien gesture that didn’t involve me or a foot, until I finally asked: “What are you doing?" "The foot,” he said, “has 26 bones. And it this row right here, the cuboid and cuniform bones”- he was now pointing to a laminated color poster of the foot - “need to be in complete alignment in order for us to get the best result from the casting." “But why on this foot,” I asked, “ when you didn’t on the right?" “But I did,” he said, with a smile. “You just didn’t notice. Not to worry. It happens all the time with my patients.” Twice I had missed something in my doctor’s office and not known it, which was unsettling - and which had yet another fragment from the night before suddenly find its way back to me: “You were my first kiss. You knew that, right? I was in 7th grade, you were in 8th, and we were in that little playground, next to the jungle gym, near the roundabout, where our parents use to drop us off before the bell rang. Do you remember?” She saw that I was searching and scanning, scanning and searching. “That kiss…that kiss…was… hilarious!! You put your whole mouth around my mouth," she said, erupting with laughter. This was shocking news, humbling news. Sadly, I had no recollection of the kiss, or that that particular kiss was her first. That I was her first. Was it true I hadn’t learned anything in all my pre-pubescent escapades, between 4th and 8th grade, about how to render a proper kiss? Had I missed the cues even then? The podiatrist pulled the gloves off with a snap and said, “Now we just have to wait for the plaster to set. I’ll be back in a few minutes. Relax. And be sure not to move your toes." I watched the doctor and his white smock exit the office together, like a man shadowed by his own ghost. As my gaze traveled from the door back across the room I saw it for the first time, directly opposite me, one more thing I had not seen before: the art on the wall - that, like most of the office paraphernalia was a playful homage to the pod of podiatry. Every room had some wry or ironic foot reference in it: The Foot Book by Dr. Suess in the reception area; the glossy poster-size image of the pink capezio tip-toeing on the keyboard in the bathroom; and the print of the turn-of-the-century photo-realistic painting of the young girl, in the examination room, where I was, taking her sock off. William-Adolphe Bouguereau, the artist and French traditionalist, had mastered the so-called licked finish technique, where every brushstroke was meant to be invisible, so as not to call attention to the process of painting. The dictum of his day was: the hand must not betray the illusion. At all cost, illusion must remain hidden from sight. 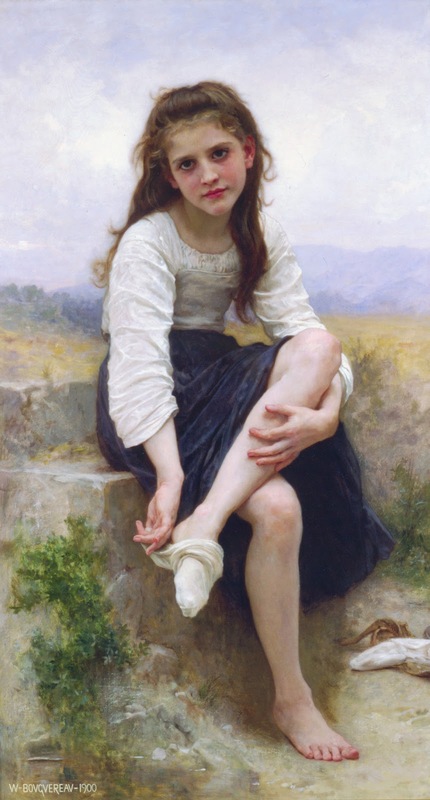 What wasn’t hidden from sight however - and Bouguereau’s oeuvre would state this plainly - was the penchant his paintbrush had for young girls - and lost innocence. The girl in this painting, dressed in a white peasant blouse and a midnight-blue velvet skirt, was seated on stone steps, on a hilltop, a grand landscape opening up behind her. On the right, at the edge of the stair next to her nearly-naked foot and knee-high was a sapling. Green, so green. The girl’s shoes and one sock were already off and in a tumble on the ground. Her left leg was draped over the right. The curl of her fingers were working the silk of her thin stocking. The anticipation was excruciating! Where was the podiatrist, I wondered then, wanting to be free of my growing discomfort at being left alone in the room so long. Alone with this young girl readying herself for a bath, whose cheeks were flushed and whose head was tilted to one side. Alone with her look. A world-weary look, mixed with something else - a shyness, a curiosity, a longing, perhaps. Once again, the haunting presence of my childhood sweetheart returned. The woman, who I had reminisced with the night before about our brief grade-school “steady” and our lives today, divorces - hers, in progress, and mine, years passed - was here now before me, as a twelve year old - the age she was when we had that first controversial kiss - in the visage of this young girl. The likeness was startling, disarming. My sweetheart and the girl in the painting were now one. But sadly, I was myself, a man of fifty plagued with plantar fasciitis - and certainly well on my way to being the age the artist was when he rendered the alluring portrait. The look taunted me. What did she want? What did she see? What did she know? What I wanted to know just then, most of all, was: where was the goddam podiatrist? I needed him to return. I needed him to save me from this look and from myself. To free me from the plaster casts, so I could leave as quickly as my feet would carry me and be someplace else, anywhere else, where I could begin to forget something actually worth forgetting - and on purpose: how old I had become, when I wasn’t looking. "Are you sure $20 is all you have?"